Babies that wake in the night. Dogs with intestinal problems in the middle of the night. It does tend to keep me sleepy. However, the thing that is keeping me most busy for the past two days is the two year old. 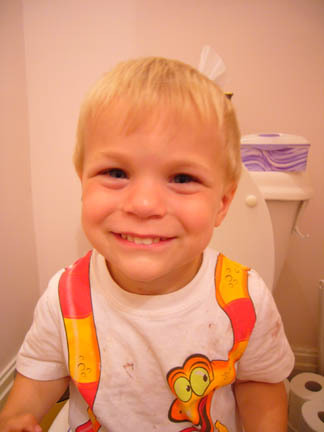 He is, as he puts it, "riding the potty train." I've known the day was coming. He's been telling me when he needed a change for quite some time and the other day I found him lying on the ground trying to change his own diaper. When he came to me and told me he wanted "to sit on the potty train" and I realized that he had control over making things happen, I knew it was time. I hate potty training. With the four year old, I waited until she came down wearing underwear and pronounced herself trained (she was about 2.5 at the time). This two year old is not quite so easy. He never tells me when he needs to go, just after the fact. But as long as I stay trained and take him frequently, he's going willingly enough. A long sit and Richard Scarry book is all it takes to get it all done. Maybe all the connections will be made soon and I won't have to be running him to the bathroom every 30 minutes just to make sure.